← HIGHLY RECOMMENDED: Sterling Vintner’s Collection 2009 Meritage. Central Coast, CA. 66% Cabernet Sauvignon, 24% Merlot, 7% Malbec, 3% Petit Verdot. $12.99. 13.5% ABV. 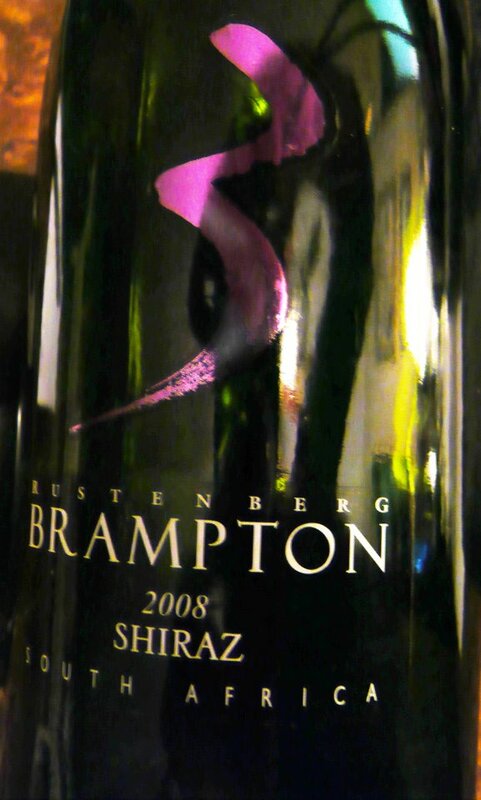 HIGHLY RECOMMENDED: 2008 Brampton Shiraz by Rustenberg Wines. Stellenbosch, South Africa. 14.5% ABV. $11.95. Cloves, oak, just a delicious big fat boy. LABEL NOTES: Matured in oak for 14 months. Characteristics of cloves, white pepper, black cherries, and hints of dark chocolate will compement game meat, stews and fine cheeses. Enjoy now or within 6 years of vintage. WINERY NOTES: Deep purple inky hues. The aromas start off savory and meaty, after which they develop a very concentrated and complex perfume and spice notes with cloves, cinnamon and violets being prominent. The palate entry exhibits tremendous concentration of flavor and fruit tannin, which surprisingly finishes fresh and dry. WINEMAKER’S TECH NOTES: Cold dry winter with low rainfall followed by a moderate summer with above average rainfall and the occasional heat wave. Naturally fermented with aerated pumpovers followed with 2 weeks extended maceration and Malolactic Fermentation in 40% new and 60% 2nd fill French 225 Liter barrels. After 20 months the wine was racked out the oak barrels and bottled. This entry was posted in South Africa, Syrah/Shiraz. Bookmark the permalink.